The Best Seychelles blogs from thousands of top Seychelles blogs in our index using search and social metrics. Data will be refreshed once a week. Seychelles About Blog The Seychelles News Agency is a new voice for Seychelles and Small Island Developing States in the world. Facebook fans 9,568. Twitter followers 1,301. Seychelles About Blog Seychelles diary is a platform managed by the Seychelles Tourism Board which allows readers and potential visitors to Seychelles to discover a wide range of activities, attractions, tourism products and services and to learn more about them via a series of articles. Facebook fans 328,417. Twitter followers 10,761. Seychelles, Mahe About Blog Mason's Travel is a leading Travel, tourism and destination company in Seychelles. We plan the most amazing island getaways, seychelles weddings, seychelles fishing, seychelles diving, seychelles adventure, seychelles accommodation. Mason's Travel Blog is the best resource for Seychelles tourism information, Seychelles tourism industry news and seychelles travel news. Facebook fans 14,127. Twitter followers 897. Seychelles About Blog North Island is a luxury private island resort, in the heart of Seychelles. The setting and natural beauty of Seychelles has inspired our island conservation practices and philosophies, and has also influenced the design of our guest spaces. Learn about our exclusive destination, bespoke service and generous experience. Facebook fans 13,307. Twitter followers 68. Seychelles About Blog Our goal is to build a platform that allow users to get information about Seychelles Airlines, Restaurants, Guest House, Beaches, Fishing & Car Hire. Facebook fans 646. Twitter followers 29. About Blog The official blog of Takamaka Rum, brings you all there is to know about the Seychelles and Takamaka Rum. What to do in the Seychelles? Drink Takamaka Rum. Facebook fans 13,187. Twitter followers n/a. Seychelles About Blog Alphonse Fishing Company - AFC - The Seychelles has long enjoyed a reputation of being among the best salt water fly fishing grounds in the world. Our mission is to provide guests with unforgettable fly fishing experiences by creating fishing itineraries best suited to their needs and own unique fishing styles. Facebook fans 15,356. Twitter followers 731. San Francisco, CA About Blog An open subreddit for anything related to the Seychelles. Facebook fans 1,149,886. Twitter followers 510,904. About Blog Travel Blog is a unique free online travel diary for travellers across the world. Lots of travellers write down a daily journal about their Seychelles travel which you can find here. Facebook fans 8,402. Twitter followers 2,673. Seychelles About Blog The Official Airline of the Seychelles. Our Vision To be a profitable, high quality Airline Our Mission Delivering to our guests, quality service with unique Creole Warmth Our Values Honesty Team Spirit Positive Attitude Respect Caring. Facebook fans 78,541. Twitter followers 3,898. Seychelles, Mahe About Blog Nature Seychelles is a leading environmental organisation in the Western Indian Ocean. It is the largest and oldest environment NGO in the Seychelles archipelago, where it is involved in environmental conservation and management. Facebook fans 4,108. Twitter followers 2,285. 12. Seychelles Mama | A Family And Lifestyle Blog With A Tropical Seychelles Twist! Facebook fans n/a. Twitter followers 2,606. About Blog Voicing the International Community on what is really happening in Seychelles. Seychelles About Blog The Society promotes the conservation and restoration of island ecosystems, sustainable development of islands, and awareness of their vulnerability and vital importance to the planet's biodiversity. Facebook fans 1,526. Twitter followers 210. About Blog An artistic movement and event where artists are creating outlets for artists. We Create a Platform for Artists. We Keep the Event Open to Everyone. We Value Artistic Expression. Facebook fans 1,107. Twitter followers n/a. Seychelles About Blog Explore Seychelles's beaches, island, restaurants, hiking trails, exotic view, snorkeling and diving spots, places to visit, delicious cuisines in our blog. Facebook fans 730. Twitter followers 2. About Blog 'Freedom means you are unobstructed in living your life as you choose. Anything less is a form of slavery'. A Seychelles Blog. About Blog Living across the world on a paradise island. Life after moving to the Seychelles! Wander Our Way is a place where I can share our stories and photos, giving you a insight into our island life. I hope it gives you a glimpse of our day to day activities, the good, the bad and sometimes just strange! About Blog A community of decent freedom loving Seychellois,determined to see Seychelles FREE from the clutches of failure, corruption, and lack of respect of Democracy and fundamental human rights. A spin off of the anti Communist league who believe in Sesel Pou Seselwa. About Blog Wildlife Vets International are supporting the development of the Turtle and Terrapin Rehabilitation Facility. They are including our project in their wildlife vet development project in Seychelles and Mauritius which was mainly focused on birds so expanding to turtles and terrapins is a good move! About Blog This is the new blog.spot for the Underwater Centre / Dive Seychelles which we hope will keep you up to date about all of our activities and give potential visitors a taste of Seychelles! About Blog A partnership between the NGO Marine Conservation Society Seychelles and Le Méridien Fisherman's Cove hotel aiming to provide guided snorkeling trails to guests, raise their awareness about the conservation of coral reef ecosystems and restore the coral reefs. 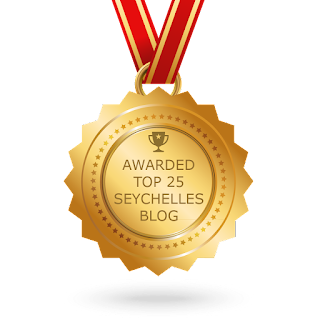 CONGRATULATIONS to every blogger that has made this Top Seychelles Blogs list! This is the most comprehensive list of best Seychelles blogs on the internet and I’m honoured to have you as part of this! I personally give you a high-five and want to thank you for your contribution to this world.